On tissue engineering, ballroom dancing, and cultural immersion! My name is Kuwabo Mubyana. I am a 4th year doctoral candidate in the Biomedical Engineering Department, working in Dr. David Corr’s soft tissue engineering laboratory. I am from Zambia, but have lived in five different countries over the course of my life. In addition to my country of origin, those countries are Papua New Guinea, South Africa, Botswana, and of course, the US. I have traveled a great deal and am proud of having immersed myself and learnt about so many different cultures. What attracted you to Rensselaer? I chose to pursue a PhD at Rensselaer after learning about the field of Biomedical Engineering, and specifically about the fascinating soft tissue engineering work being done in Dr. David Corr’s laboratory. It was the ability to do this type of research that drew me to Rensselaer. How has your Rensselaer experience been? I have loved the past 3 years here, working closely with my advisor and lab mates. Serving as a TA in the Introduction to Biology course and the Biomedical Engineering Lab has reinforced my passion for sharing knowledge with others. Research in Biomedical Engineering is rigorous and challenging. Naturally, a good work-life balance is a critical to long term success. 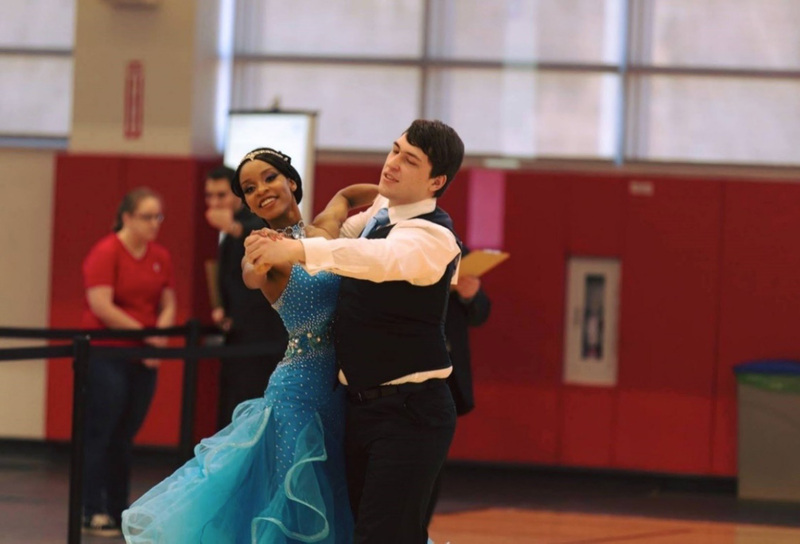 At Rensselaer I was fortunate to find an organization that gave me the opportunity to pursue my other passion – ballroom dancing! I joined the team three years ago, began competing, and served as team captain for two years. Tell us about your research? Why is it important? Tendons in our bodies have poor healing capacity, which contributes to significant clinical and financial burden. I am developing a technique to engineer individual scaffold-free tendon fibers. As the fibers are developing, we subject them to mechanical loads as well as growth factors, such as hormones. This way, we understand how mechanical and chemical stimulation affect tendon growth and development. This research will lead to better tendon graft models. What is doing research like? What drives you to excel? Research is both challenging and rewarding. It is challenging because you are constantly working on problems that do not have an answer for yet. There is a lot of trial and error and troubleshooting. On the other hand, it is rewarding knowing that you are contributing to your field in novel ways and paving the way for more impactful, future work. You recently won an award at a biomedical conference. Congratulations! Tell us about it, and what it means to you. I recently gave a talk on my tendon-engineering research at the 15th International Symposium on Ligaments and Tendons (ISLT) in Orlando, Florida. I received the Savio L. Y. Woo Young Researcher Award in Biomechanical Research. It was inspiring to be surrounded by so many eminent biomedical researchers from across the globe, and to learn about the innovative work being done in my field. It was also a gratifying experience to be praised and recognized for the work that I have been doing over the past three years. I would like to lead research in industry. I want to use my research skills to solve important tissue engineering problems and be part of a larger research team. I am competitive ballroom dancer and have competed at both the silver and gold level across the North-East. When I am not working, I am taking dance lessons, training with my partner or I am at collegiate competitions. I also spend time mentoring and teaching beginner social dancers. When I am not dancing, I am outdoors, hiking, or doing yoga. I also like to try new restaurants in the Capital region. There is a diverse range of restaurants springing up every couple of weeks and they are a great excuse to try something new! I grew up reading a lot of Victorian novels and to this day, that is my preference. For as long as I can remember, my favorite author has been Charlotte Bronte. However, my favorite book is from a different genre: The Book Thief by Markus Zusak. A favorite movie would be difficult to pick, but one that has always stayed with me, I watched several years ago. It was called Empire of Sun. Generally speaking, I connect with books and movies about resilience. Any advice to new graduate students? Be prepared for a challenging experience. If you are not being challenged every day, you are not learning. Embrace the things that make you different and make sure you find time to enjoy your hobbies outside of class and the lab.